I'm using IE8 on Windows 7. I'm trying to delete an add-on from my "Manage Add-ons" panel. But when I double click the add-on I'd like to delete, the "Remove" button is grayed out. Only the disable option is available. I've gone to the path it points to and deleted that folder. 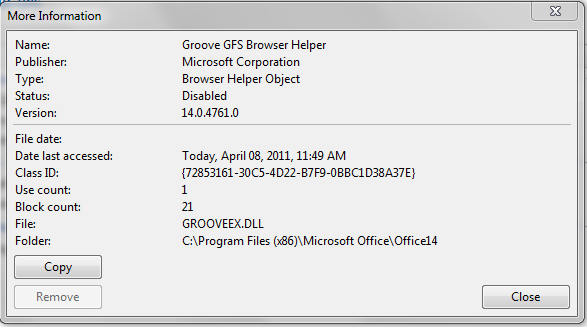 I've also searched the registry to delete keys and went to Control Panel to uninstall the related installation package. How to manually remove stubborn add ons in Internet Explorer. Double click the add on, you will get a pop up window, hit the copy button and save to a text file, close IE, then copy the Class ID number with brackets from the text file, then search (> Keys) (match whole string only) the registry for this string, then delete all found from the registry, there may be many of these unique keys, use F3 to find all of them. Be sure to collapse the registry before you start the search. Get AutoRuns from Sysinternals (owned by Microsoft) and go to the Internet Explorer tab. You should be able to either disable or remove the add-on. Or check in your add-remove programs to see if it's a program listed there. Or, if it's not in add-remove programs, get Revouninstaller, which will allow you to uninstall items that are not listed in the windows add-remove programs. Open Internet Explorer >> Tools Menu >> Then select Internet Options >> Then Advanced tab.> then select reset at the button Then tick Personal Settings and >> Reset again. and you are Done. I used Hijack This from Trend Micro... I found the disabled addon that could not be removed, noted the name, Ran Hijack This, checked the box by the stubborn addon, then clicked fix. You should be very careful with this tool. The addon was a BHO, unfortunately not much of a browser helper. Had a similar problem using Internet Explorer 11 and Windows 8. The following malware installed itself into the browsers Add-ons under the “Run without Permissions” section. I could not disable them as the disable button was greyed out. First I uninstalled any programs that looked unusual via the Control Panel. Follow this posting I copied and pasted the Add-On details into notepad. Opened Regedit and searched for the keys. Each of these had 7 keys to delete. Not 100% sure they are gone for good… Why IE allows unknown Add-ons to install in “Run without Permissions” section I don’t understand… IN the IE Add-Ons you have to click the drop down button to locate this section which is not that easy to find. Not the answer you're looking for? Browse other questions tagged internet-explorer browser-addons uninstall or ask your own question. CLI way of uninstalling a Windows update? Why can't I uninstall pacman package with -Rs settings? Is there a way to remove a program that requires admin access to uninstall, but does not prompt for it? What's the correct way to remove broken uninstall in Windows?